The Thanksgiving meal, what do you bring to the table? Do you bring the green bean casserole? The brussel sprouts? The pumpkin pie? Dinner rolls? The funny story? Good conversation? Or the wine? Everyone brings something, eatable or not. In my family, Aunt Sue brings the rolls, green bean casserole, and maybe if we are lucky, pumpkin squares. My sister-in-law, Andrea, brings dirty snowballs – think Oreo truffles, hell’s bells they are good. My mom makes the stuffing, which is actually my dad’s recipe, and he guides her through the creation of it from the kitchen table as he is drinking his coffee (with Bailey’s I might add!) and rummaging through the black Friday ads. Megan, sister-in-law 2.0, she brings the stories, the laughs, and all the good gossip. She brings the fashion too – she can wear scarfs. I love how she can pull off a scarf and big earrings. I envy her style. Peter brings the drinky drink. Evan brings stories, good stories, funny stories. We all bring our appetites. I normally bring some new dessert. Full of chocolate. We all love chocolate. As of yet, I have not found/settled on my dessert for this year. I am going back and forth between a chocolate tart, bread-pudding, or maybe a cheesecake… But I do know what I am bringing to the table for the leftover dinner. The dinner of leftovers. 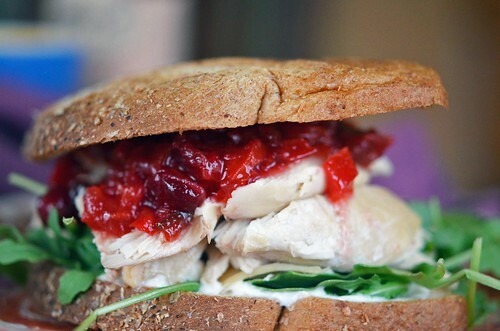 Can we just state a fact…leftover dinner is always way better than the formal Thanksgiving meal. Always. Better. I am not sure why. Maybe it is because the anxiety of providing a topnotch meal is over, football is the main concern, food comas have come and gone and come again, and well, the wine and Christmas Ale is doing what wine and Christmas Ale do. 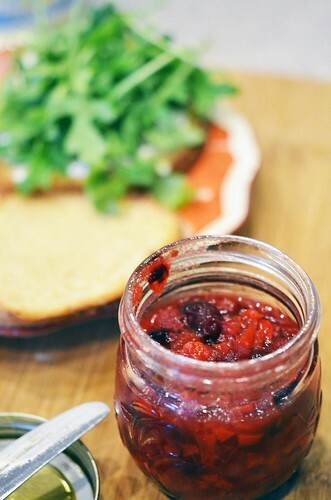 So, at the unofficial official best meal of the day – I will be slathering spicy cranberry relish on my toasted turkey sandwich, with a touch of mayo and maybe some stuffing. Why not right? 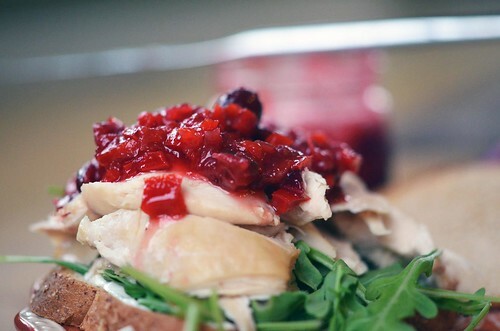 Make this next week for turkey day or the day after turkey day. In a large pot, combine the finely diced red peppers, jalapeno, cubanelle pepper, crushed red pepper, salt, and sugar. Bring to a simmer over medium heat; cook for about 5 to 10 minutes. The sugar will melt and the peppers will release quite a bit of liquid. Add liquid pectin and lemon juice and continue to simmer for an additional 10 minutes. Add cranberries, cook for another 10-15 minutes. 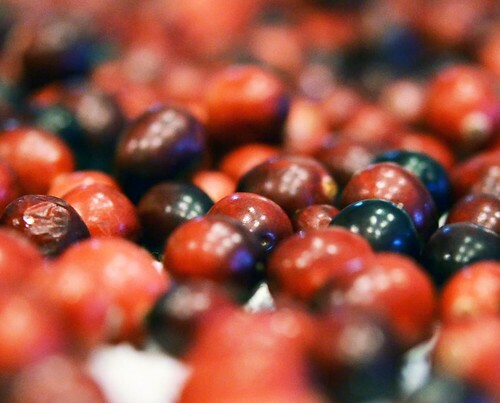 The cranberries will begin to pop open and it will begin to thicken. Stir occasionally and smash a portion of the cranberries against the side of the pan, squishing them. 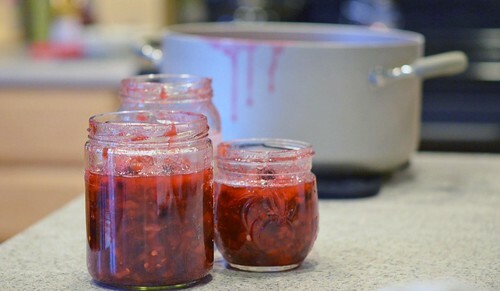 Remove from heat and transfer to glass jars with lids. Let cool and then place in refrigerator. Good for up to 3 weeks when stored in the refrigerator.